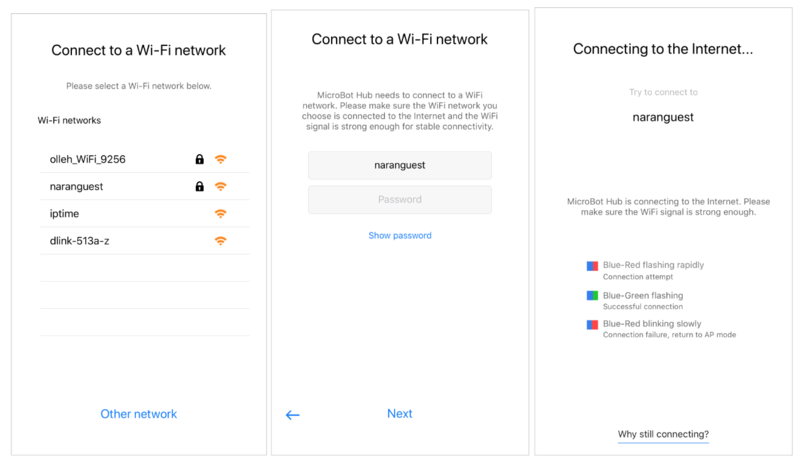 To change the WiFi network to which MicroBot Hub connects, you first need to activate the AP mode. Then, you will register your new network. Activate AP mode manually. Make sure the Hub is powered on, place your hand over the LED sensor, and wait about 5 seconds until the LED starts flashing in red and blue. When MicroBot Hub boots again after a reset, it might get stuck during the procedure. In this case, please reboot your MicroBot Hub by unplugging and plug it in again. Change the WiFi network. In MicroBot Push app, tap on the 'MicroBot' icon at the top left corner or slide from left to right to access the left-sidebar, tap on the 3 dots [...] at the top and find your MicroBot Hub in the list. Then, tap on the 'network' icon, go to your device's WiFi settings and select your Hub's SSID. Configure the new network. 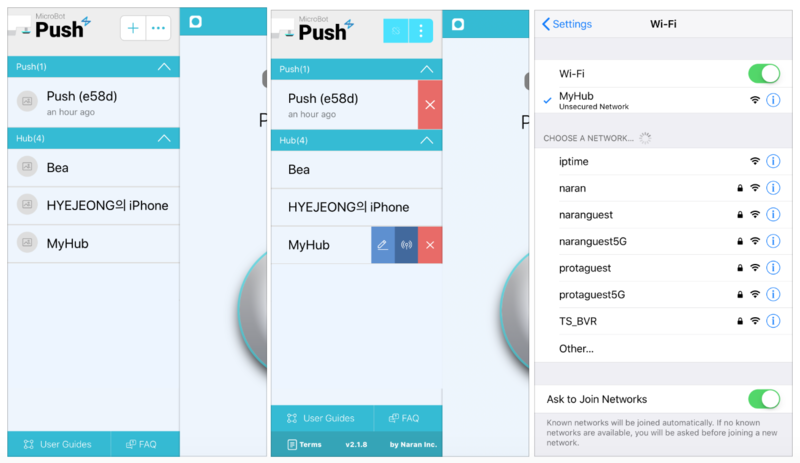 Go to MicroBot Push app, enter the new network's SSID and password and wait until the Hub connects to the new network. The Hub is successfully connected when the LED becomes green when hovering over the Hub's sensor. See MicroBot Hub S' LED Status. 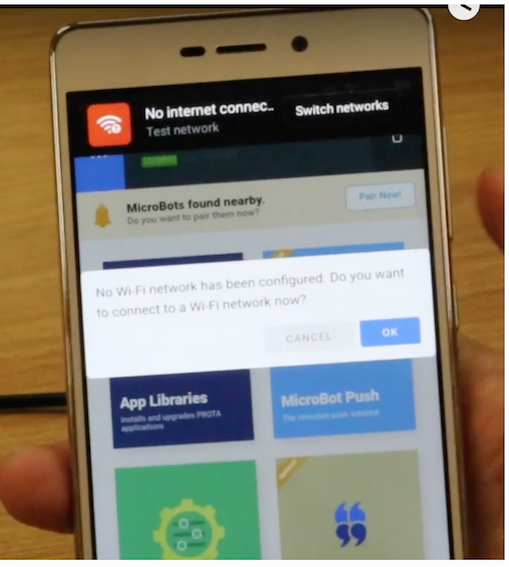 Note: If you are unable to connect MicroBot Hub to your new network, please see Why I can't connect MicroBot Hub to my WiFi network. There are 2 methods to activate AP Mode: manual activation and using Settings app. 1. Hover your hand quickly over the top of your Prota S. A green light should light up immediately. 2. Quickly hover over the top for the second time(within a few seconds) and hold your hand on top until the light starts blinking red and blue. You have now activated the AP Mode on your Prota S! AP Mode is now activated! When Prota initializes itself, sometimes it might get stuck during the procedure. In this case, please reboot your Prota to make it work. If it still doesn't work, please make sure you are using the correct power sourcing for Prota device. You have to use a power adapter that supports 5V 2A voltage. Please do not use PC, laptop, or USB type power strip. Also, we advise not to use the charging adapter of a smartphone. If the problem persists, please contact Naran Support Team. 1. Open the WiFi settings on your smart device, find the Prota's SSID. 2. After successfully connecting to the Prota, open Prota Space app. 3. When opening the app, the message 'No WiFi network has been configured' will appear. Press OK to start connecting to a network. 5. 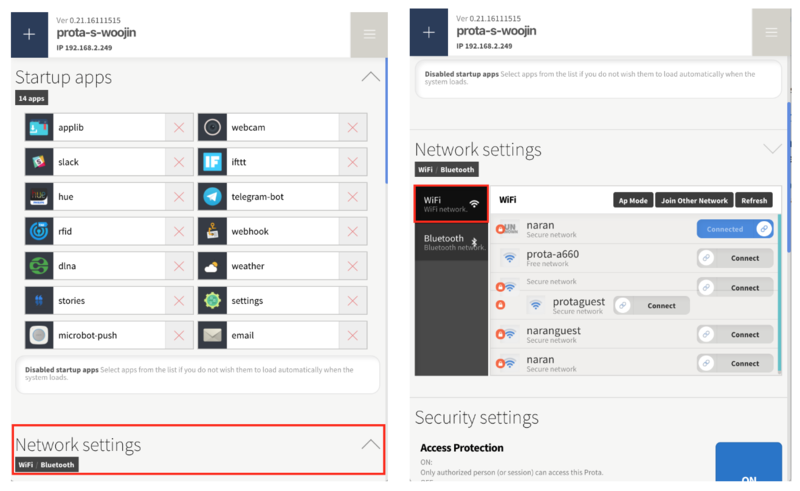 Tap on the 'WiFi' tab, choose the desired WiFi from the list of available networks and connect. 6. Your Prota has now connected to the Internet again and should be ready to use! Please note that the configuration might take a few minutes after connecting to the desired network. Once Prota has successfully connected to the network, the led will stay green and then turn off. If not, Prota will automatically enter AP mode. You should try the procedure again. Please confirm the status and password of the network where Prota connects.